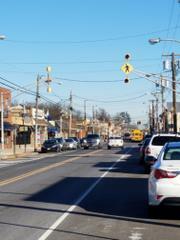 Acting Chief Christopher Fletcher reports to the community that the Maple Shade Traffic Safety Department recently completed a project with the Burlington County Traffic Engineer’s Office to increase pedestrian safety on Main Street Maple Shade, also known as County Route 537. 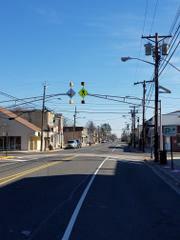 On February 8, 2019 the Burlington County Traffic Engineer’s Office replaced the overhead signal arms on the two lighted pedestrian crosswalks on Main Street. The new signal arms are longer and centered over the roadway so as to be more visible to the approaching vehicles. In addition to this improvement, lines were repainted on three crosswalks, and existing signs were replaced with new brighter signs. 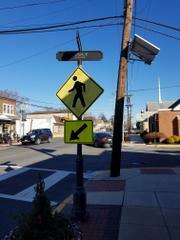 The Maple Shade Police Department reminds everyone to STOP AND STAY STOPPED for pedestrians in a marked crosswalk. 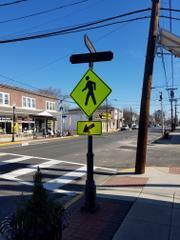 For more information on pedestrian safety, visit https://www.nj.gov/oag/hts/pedestrian.html . Please help us work together to make Maple Shade a safe and secure community.